Home › Barack Obama › Is Ron Paul “Blacker” than Barack? 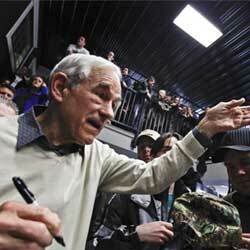 Is Ron Paul “Blacker” than Barack? Bill Clinton was considered the first black president in America before Barack ever, uh left Kenya or um was in Hawaii or whatever. Anyway the strongest most avid supporters that Billy Clint ever had was black people. So much so we made him one of us. 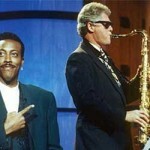 Maybe it was his appearances on the Arsenio Hall show playing a saxophone or the way he handled that Ken Star Monica Lewinski investigation. It sure wasn’t that he appointed the first black white house cabinet members or the most. Franklin D. Roosevelt did that with his Black Cabinet. It was just something about him that black people really liked and trusted, but what and why? Enter Barack Obama. His speech at the democratic national convention was surely a home run and catapulted him into the hearts and minds of Americans desperate for change after a hellish run under George W Bush. Obama seemed to say all the right things at all the right times and people took to him like flies on poop. Now after being in office a few years that honeymoon is over and people are wondering if we got short changed. Black people too. Ron Paul may not be the nominee for the Republicans this year but he is no doubt the rock star of the election. Who would have predicted that back in 2008? 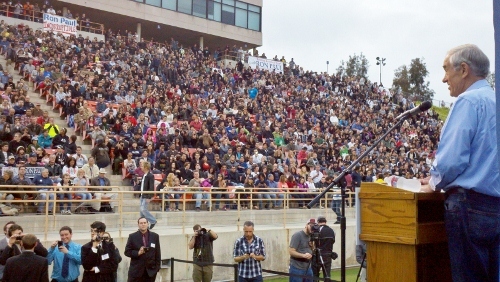 It’s been Ron Paul who is giving the speeches to the packed out stadium crowds with people absolutely mesmerized with his message of liberty and freedom in place of Hope and Change from the last election cycle. How did Ron Paul connect with Black People? Maybe it was his comments on ending the “war on drugs” which he says is racist in its very origin. This is something that so many black people have been screaming about for years but to finally hear a presidential candidate say it has a real impact. Especially a white one. Obama has said he does not support legalizing drugs then he got caught running the Fast and the Furious thug-life machine gun cocaine program with Eric Holder. This story broke after saying he was going “Young Jeezy” on his second campaign. Young Jeezy is a gangster rapper who flaunts his success selling cocaine in his music. Shouldn’t a community organizer know the impact crack and cocaine have on a community? Which side is he on? What do you think? ‹ No Serena Thank you & Venus too.